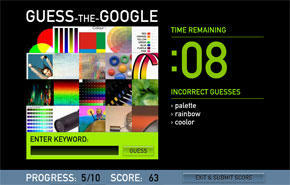 Have you seen the cool "Guess the Google" game that Grant Robinson has created? It picks a keyword at random, searches Google's huge repository of images gathered from the web, and places them in a grid of 20 images. You then have 20 seconds to guess what the keyword or theme of these images is. It's quite challenging and addictive! This entry was posted on Monday, July 18th, 2005 at 2:55 pm and is filed under Share your views. You can follow any responses to this entry through the RSS 2.0 feed. You can leave a response, or trackback from your own site.